Giving corporate gifts is a great opportunity to show your employees, the executives at your company, and your clients that you appreciate them. 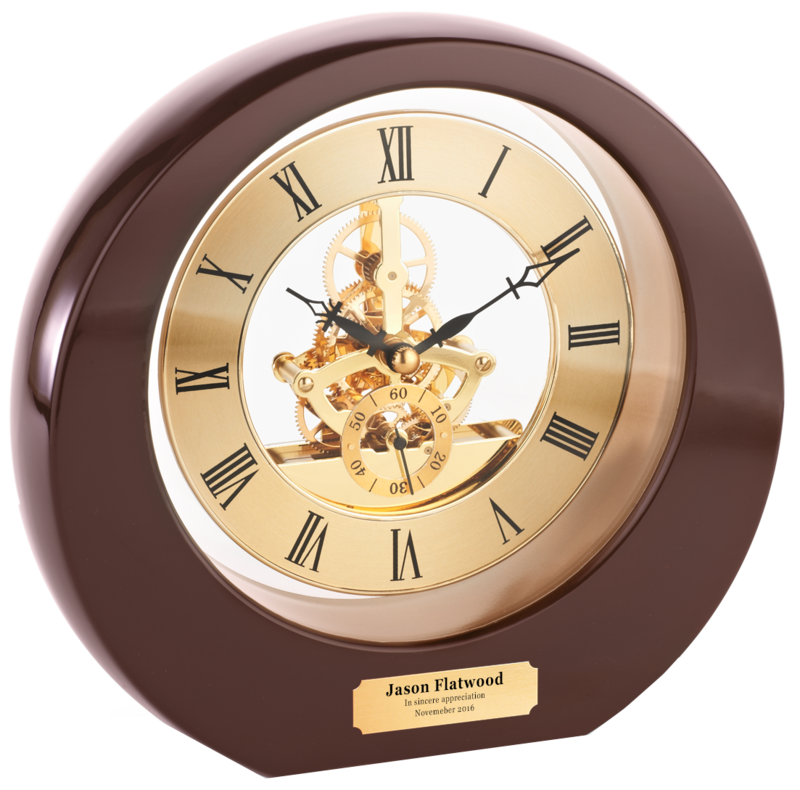 Unique corporate gifts from Successories are great for any time of year, including for holidays, awards ceremonies, retirement recognition, and more. Make your team and clients feel special with these corporate gift ideas to show your gratitude. Our unique selection will wow recipients. Make work fun and productive with these gifts. Personalized Desktop Gifts for every employee, client & more! Great for work, home, and on the go, these bags and totes are stylish and functional. Water, coffee, cocktails, and other beverages can be enjoyed in these high-quality containers. Give a group of gifts that perfectly fits the recipient's needs or style with these gift sets. 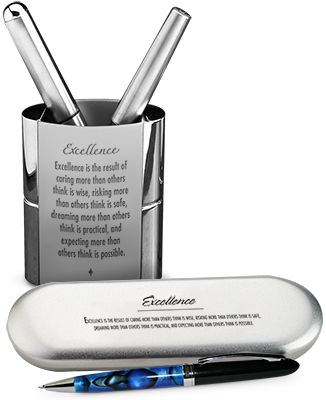 These beautiful pens and pen holders display motivation messages and help recipients stay organized. Gift something that's remarkably one-of-a-kind with a wide variety of affordable personalized gifts. Brighten up someone's office with decorative desk accessories that motivate or are stunning to behold. Office supplies get an upgrade when they're turned into fun and eye-catching gifts. You should consider corporate gift ideas for your business because they're a cost-effective way to strengthen relationships with your employees and your clients. According to the Internal Revenue Service, you can deduct $25 for business gifts you give per person. Because the impact of giving a gift may result in increased loyalty or sales for your business, corporate gifts are a valuable investment for any business. Here are some tips for creating a corporate gift-giving strategy. Take a look at your upcoming work schedule calendar to identify opportunities that are appropriate for gift-giving. Major holidays are an obvious choice to identify first. Then, you might look at company-wide events you have scheduled, such as state-of-the-business review meetings or annual parties, and consider incorporating a gifts element for employee recognition. Beyond the scope of the entire company, you should ask managers about their ideas for using gifts to encourage employee motivation and productivity and increase retention. 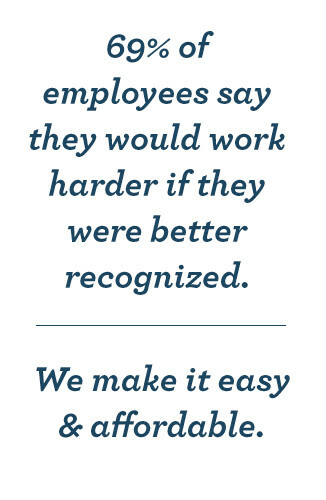 If certain departments hold weekly meetings, they might want to include an employee recognition portion. Or, if there's a team-building event coming up for a department, gifts for participants might be appropriate. Reinforcing your relationships with your clients is vital for your bottom line. Giving corporate gifts to those you do business with keeps you at the forefront of their business decisions and helps to improve sentiment for your company. Determine how frequently you want to give gifts to clients, and how much you'd like to invest each time. Employee anniversaries and retirements are major events in your business that deserve to be recognized. 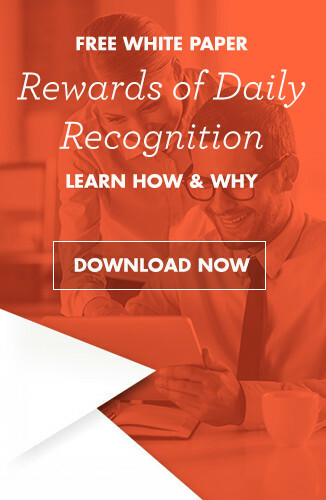 Giving unique corporate gifts to commemorate these milestones makes the employees feel valued, shows your commitment to your team to other employees, and is a way to convey your appreciation for all your employees have done. Corporate gifts for major work events can increase retention at your business and lead to future referrals when employees leave. If you want to encourage creativity and diligent work at your business, some healthy competition among or within departments can increase your business revenue. Competition can be fun for employees, and rewards don't have to be expensive to create meaningful results. Think about ways you can motivate your team by using contests and prizes to achieve more in your business. Not all corporate gift-giving has to be planned out. Ordering a wide variety of gifts to have available allows executives and managers to give immediate rewards for outstanding performance. Instead of having to order them and wait for delivery, keeping a steady supply around encourages your management team to be on the lookout for behavior that deserve reward, which can inspire everyone at your company to perform at a high level. When you calculate the costs involved in recruitment, on-boarding, and on-the-job training, you can see how valuable it is to retain a single employee versus having to fill a new position. Use these types of guidelines to create a sensible gift budget that works for your business, with the goal of achieving a return on investment through loyal employees who appreciate the corporate gifts you give. You can divide this budget among calendar dates, what you want to have available at all times for immediate recognition, how much you want to dedicate to reinforcing client relationships, and when you plan on recognizing employee milestones so that you stay on track. When you introduce a corporate gifts strategy into your business, create goals you want to achieve with the help of giving gifts. Whether it's a number of new referrals, a percentage you want to decrease employee turnover by, or an amount of new business from clients, match your corporate gift-giving efforts with your goals. You may be able to identify trends that help you realize the return on investment that a fun activity like gift-giving provides for your business. 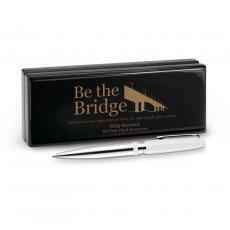 Ready to boost your business's bottom line with unique corporate gifts? Browse our corporate gifts here. I use it to mark up important paperwork. This is just a simple idea that can be part of a personal thank you for a job well done. Love it!